I'm sorry, roaches that I've squashed. I didn't know that one day your kin would be our nuke-detecting salvation. 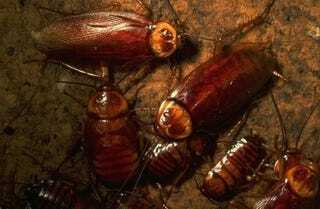 "Cockroaches really are the perfect medium for this," says William Charlton, an associate professor of nuclear engineering at the university and a principal investigator on the project. "They can go for extraordinarily long periods of time without food. They exist on every continent except Antarctica. They're very radiation resistant, and they can carry extremely large amounts of weight compared to their body mass." That's right: instead of sending humans into possibly contaminated areas, we're sending our army of roaches. And we're not stopping there! According to the Texas A&M researchers, other applications could include search and rescue and counterintelligence. And scaring the bejeebus out of rival scientists.